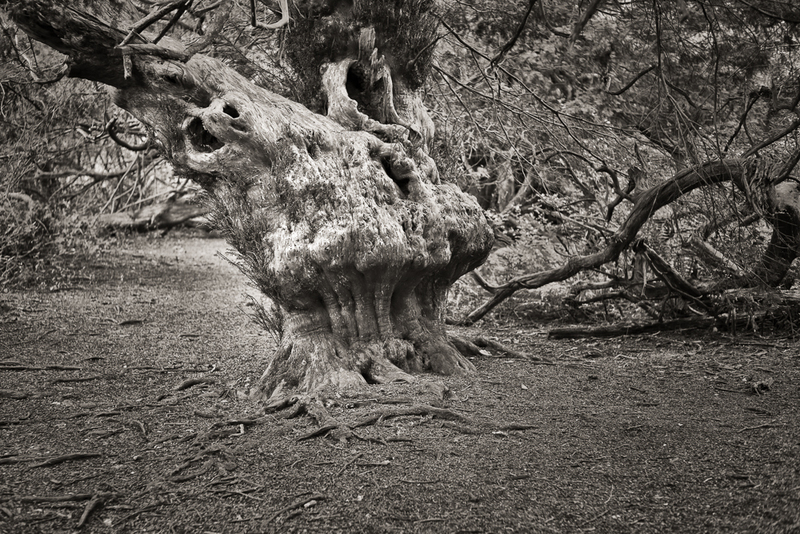 The ancient yew trees of Kingley Vale – nature’s cathedral or a place of ghosts? The ancient yew trees in Kingley Vale Nature Reserve in West Sussex is a sight to behold and is perhaps one of the finest groves of its type in Western Europe. These magnificent trees are thought to be 2,000 years old which would mean they are some of the oldest living things in Britain. 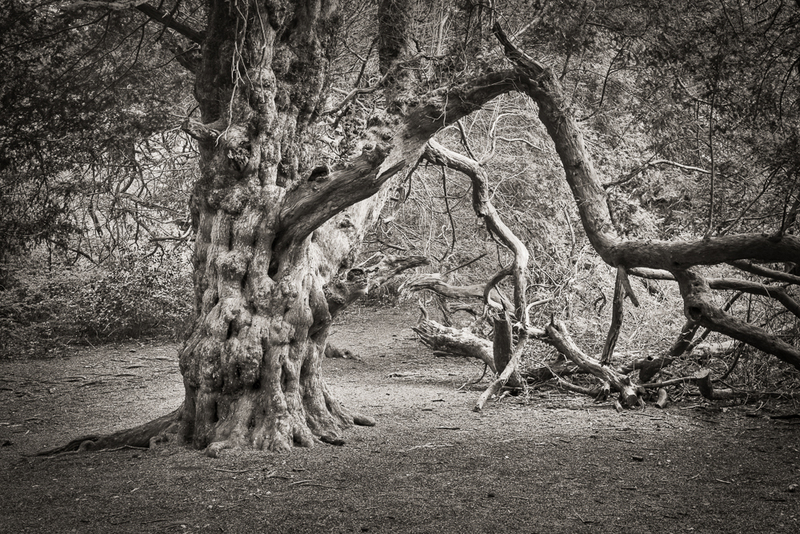 The gnarled bark of the twisted trunks and the contorted, arched branches which reach down to the woodland floor are beautiful, but also eerie in their sometimes almost ghost like appearance. The grove has been likened to a cathedral. It’s dark beneath the canopy with shafts of light occasionally breaking through. The trunks represent pillars and the branches form arched trusses supporting the trees’ canopy or the roof of a cathedral. This comparison is not without foundation as yew trees are planted in churchyards. 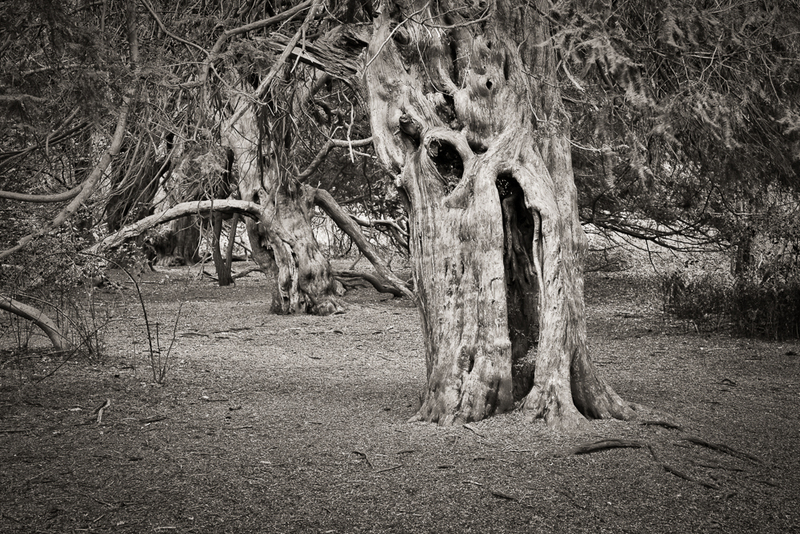 Trees, particularly long lived yews were worshiped in the days before Christianity. Photographically I found it difficult at first to find strong compositions and the light was also a challenge. You can probably imagine how dark this yew tree grove would be, even in the summer. However as soon as the sun broke through, the scene was transformed into one of high contrast making it all but impossible to capture the true essence of this location. Although these frames were all taken when the sun was obscured by cloud I still had to avoid strong highlights where gaps appeared in the foliage. After about an hour the sun emerged for the remainder of the afternoon. There was far too much contrast and the camera and tripod were packed away for another day. Although I have walked around Kingley Vale on many occasions, I have not photographed these trees before. I would like to do so again as familiarity with any subject allows your eye to see different ways of photographing something which you may have tried to capture many times before. But weather conditions, the time of day, the changing light of the seasons and countless angles of view for different compositions allow you to return again and again. I am sure that I will find new ways to observe, to interpret, and to appreciate a subject which perhaps I thought I already knew. For anyone wishing to visit Kingley Vale Nature Reserve there is a car park at West Stoke, a small hamlet to the north of Chichester in West Sussex. The footpath to Kingley Vale is clearly marked and it will take you about 20 to 30 minutes to reach the Yew Tree Grove. Have fun! Don’t bring your own food and drink in here! What a coincidence that you should post this on the very day I finally made a good image of what I think might be another ancient yew tree. Have a look at my post. What do you think? A fascinating place to visit. You’ve done a great job in getting the light just right – I can image how difficult that must have been. You are absolutely right about the benefits of returning to places again – the light is never exactly the same and we find possibilities never previously considered. I hope to return in the next few days. Overcast/damp conditions should allow picture making a little easier. Some wide angle views and possibly a few intimate ‘portraits’ or abstracts is what I have in mind.